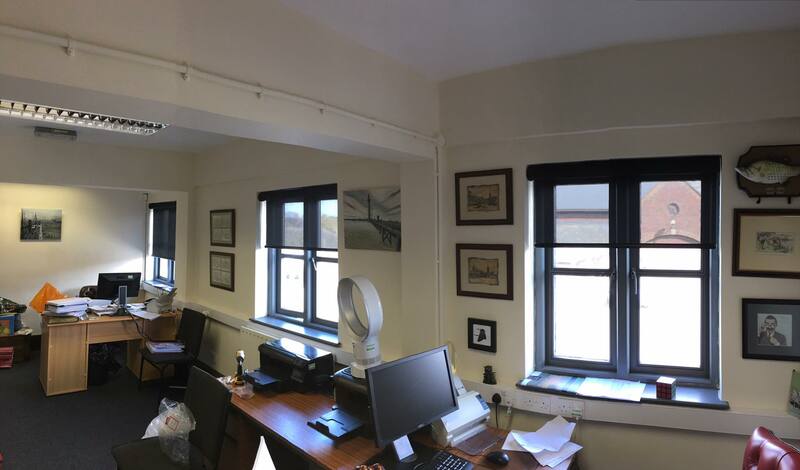 This office based customer was about to upgrade the furniture and wanted to refresh the blinds as the current verticals were looking tired. They don’t have a privacy or security problem being on the 2nd floor or a heat issue and enjoyed being able to see out but on occasions need to reduce the light levels from the rising easterly sun. From our recommendations a black screen fabric called Perspective in Black Iron was chosen because you can see through darker fabrics better as it doesn’t flare back from internal light sources and they opted for a closed black cassette box with matching fabric covered facia, a fabric wrapped hem bar and a chrome chain to finish off. The closed cassette box stops dust from settling on top of the bind tube and using a dust slide on the fabric as it is lightly the blind may sit in the same position for long period. We always like to think of the practicals of daily life at CoolGlass.